Lease options guru Rick Otton fined $18mill , the Australian Federal Court has imposed record penalties totalling $18 million against We Buy Houses Pty Ltd (We Buy Houses) and its sole director, Rick Otton, for making false or misleading representations about how people could create wealth through buying and selling real estate using lease options. The penalties of $12 million imposed against We Buy Houses, and $6 million imposed against Mr Otton personally, are the highest ever imposed for contraventions of the Australian Consumer Law by a corporation and an individual, respectively. The Federal Court also banned Mr Otton from managing corporations for 10 years in Australia and permanently restrained Mr Otton and We Buy Houses from further involvement in the supply or promotion of services or advice concerning real property transactions or investment. 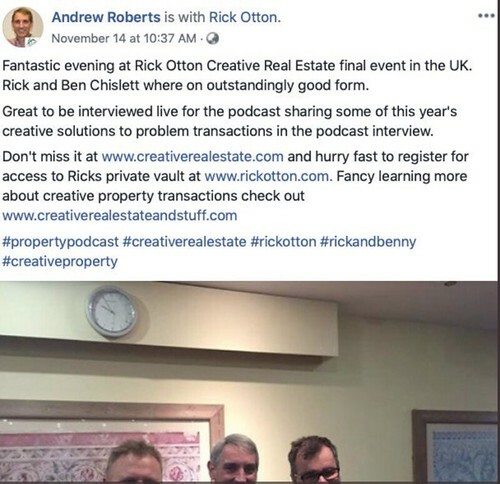 Rick Otton was the mentor of Ben Rogers, who went bankrupt after borrowing over £2million from within various wealth creation networks including Property Investor Network and Gill Fielding's networks where he was a lease options coach/mentor. Despite the cloud over Mr Otton's head, he has allegedly recently been in the UK, being promoted within wealth creation networks and working on podcasts with another of his disgraced students, Ben Chislett. As Mr. Otton is now barred from working in Australia, it could be that he is intending to make the UK his next base of operations. There are other trainers in the UK currently teaching lease options - from a quick google search these include Samuel Leeds, Gill Fielding, David France, Property Mastery Academy, Glenn Armstrong, Reena Malra, and Mark Jackson & Wendy Patton - some of them trained by Rick Otton - so be warned that this strategy may not be all that is claimed! DON'T MISS - Ben Rogers - is Simon Zutshi correct? Following having been found guilty of "deceptive conduct", the Australian Federal Court has imposed record penalties totalling $18 million against We Buy Houses Pty Ltd (We Buy Houses) and its sole director, Rick Otton, for making false or misleading representations about how people could create wealth through buying and selling real estate using lease options. This reminds me a saying" if it sounds too good to be true, it can't be true", it is so important to do your own DD rather than just listen to these upsale pushy mentors who sells you a dream and take your hard earned cash along the way. Indeed. The whole sector is completely unregulated and I suspect that millions are lost each year, but the victims have very little comeback or routes of redress. I applaud the Australian Courts for making such a strong decision and hope it resonates here. The $18m is the largest fine in Australian property history. I think it's the way he marketed his book that upset the government (and ultimately the banks) with how to buy a house for a dollar. Options are still a great way to buy land and property. Considering what happened to Rick I'm still waiting to see someone sell a garage at a garage sale, a car boot at a car boot sale and get free cash at a free cash cash machine etc... I think if you ruffle too many feathers you sometimes attract the wrong type of attention. The banks are a formidable foe. If you read the original thread that warned about Rick Otton you will see a long trail of people who lost money to him and also some of his students did deals that went sour. It was far more than "marketing" that brought about this fine and Rick Otton being disbarred for 10 years. The outcome of this court case was all based around protection of consumers. Options are fine on commercial property, but not residential where people's homes are involved. I play the devil's advocate here. I met Rick Otton in London in 2007 and subsequently bought his information pack. I did two lease/option deals with his useful documentation, and genuinely believe that seller (to myself) and buyer (from myself) were wholly satisfied customers. These were not long purchase options (one year with a one year payable extension) but I did make profit from the deals, and I did not think any party was misled or came out of the deals in any way less well off than when they entered the deals. Rich threatens and shakes up the status quo of comfortable bedfellows of the lenders, CML, banks, intermediaries, conveyancers and other folks who make their money from the perverse legal framework that surrounds the English law pertaining to house buying and selling. I know of no other industry where it is OK for a potential buyer to go right to the wire of exchange of contracts, then back out with no legal or moral obligation to cover seller legal costs to date and no doubt other costs. At least Scotland ensures that this does not happen. Why not try to find Rick Otton or his named associates and interview them too. That at least will give them a chance to explain their side of the story. The Australian government is hardly a fair player. If you think our UK housing market has been distorted by government interference (first time buyer loans, etc) it pales into insignificance when compared with what the Oz government has done to prop up residential property prices at any cost. I visited there 3 years ago and attended a party which included builders, investors and unfortunate tenants who were priced out of the letting market far more severely than the UK outside of London. Don't always believe that just because a government cuts somebody down, it is because they were breaking a law. They are the biggest crooks on the planet. After 11 years I still refer to Rick Otton's literature and find useful information therein. How lovely to see you pop up here. I do hope you are well? Thank you for sharing your first hand experience of Rick Otton and lease options - all views are welcome here. However, it wasn't the Australian government who shut him down, it was the Australian courts. A court verdict is pretty conclusive, because it was made after both sides put forward their version of events. Secondly, if you read some of the other threads I linked to, you will find that many consumers lost money after getting involved with RO and his students, including Ben Chislett and Ben Rogers, who both went bankrupt. The list of people badly/negatively affected by Rick Otton, some of his students, and lease options is significant and it is all documented on the other threads linked to from here. Hi Vanessa, thanks for the welcome back. I have had a pretty bad year since last November, health wise, but am recovering now with a good diet, an exercise regime, a lot of rest, trying to improve my sleep patterns, and finally (not yet done), to get some quiet time for relaxation. Sahar has also been not too well and we both lost our fathers during the past twelve months. We are both looking forward to a 2019 that may be better for us than recent. Sorry I have been absent for a long time. Rick Otton has withdrawn the appeal against the $6million dollar fine against him personally. Australia’s most infamous property spruiker Rick Otton, the controversial "How To Buy A House For $1" author, has filed for bankruptcy, crippled by the largest fine in corporate history. It comes five months after he and his company were fined $18 million for misleading property investors following ACCC legal action. The Federal Court judgment found breaches of Australian Consumer Law of $12 million against Otton’s business and $6 million against him personally. But his four bank accounts have just $18,800, including $5.74 with NAB, ­according to his statement of affairs filed on the national personal insolvency index at the Australian Financial Security Authority. There was $37,000 owing on his credit cards. ​There was little property listed as assets, just a Otton family superannuation trust owning a $2 million commercial building, along with an option to buy a 45,000 Euro apartment building at Saint Spyridonas in Greece, where is shifted his spruiking sessions.